3001-3009 Sani-Ceptor Stainless Steel Floor Drain - Jay R. Smith MFG Co.
Used in all locations where superior sanitation, corrosion resistance, durability and longevity are required. Essential in restaurants, kitchens and all types of food handling areas for ultimate sanitation. Ideal for breweries, dairies, creameries and similar processing plants where sanitation is paramount. Also suitable for use in nuclear and fossil fuel power stations, chemical plants, laboratories and other areas where the corrosion-resistance of type 304 stainless steel is satisfactory for the intended service. Smith No. 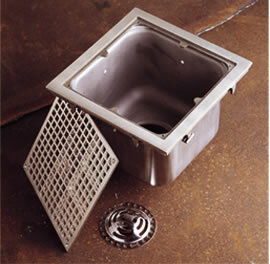 3007NB stainless steel 12 ½” square-top with nickel bronze frame and secured grate, stainless steel perforated sediment bucket and stainless steel dome bottom strainer. Flashing clamp in membrane floors. (Add suffix –FC for flashing clamp when specified). Smith No. 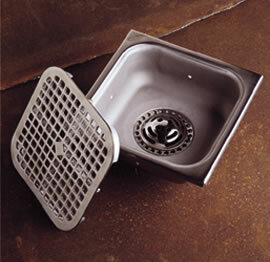 3001 series stainless steel 12” square top with stainless steel loose set grate, perforated dome bottom strainer. Smith No. 3001 (-12) for half grate or Smith No. 3001 (-13) for three-quarter grate. Flashing clamp in membrane floors.